DotA 6.77 AI Fun Map has been released. 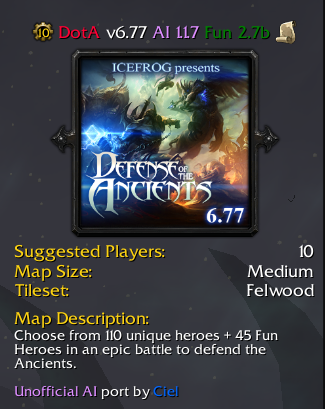 It’s a fun oriented map brings extra heroes and items in your normal DotA making it more fun. Description: DotA 6.77 AI 1.1.7 v2.7c Fun by Superwaitsum (originally by Ciel). WARNING: Use -dm command before -fun to prevent some bugs. Sometimes in 5vs5 Persuasive can give you a crash, be careful.